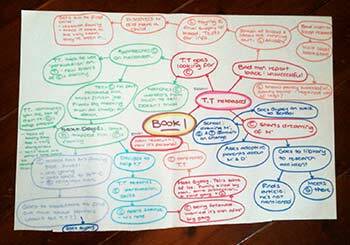 There are so many decisions to make when planning a new novel. Sometimes you can let the story or the characters drive these decisions, but sometimes you’re faced with two (or more) paths you could follow that would severely alter the direction of your story. When this happens, it all comes down to you. As the head of your story’s world you have to be prepared to make some tough choices. First step: brainstorming. 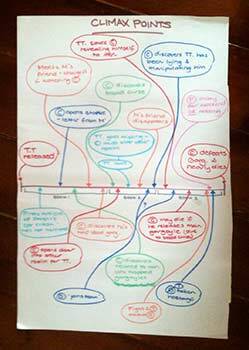 I put a timeline across the middle of a large sheet of butcher’s paper. At the beginning of the line I wrote a summary of the Inciting Incident, and at the end I detailed the Final Showdown. Then I filled the page with every big climax point from the story. I linked these all up to the timeline, working out how each revelation and point of action jigsawed together. 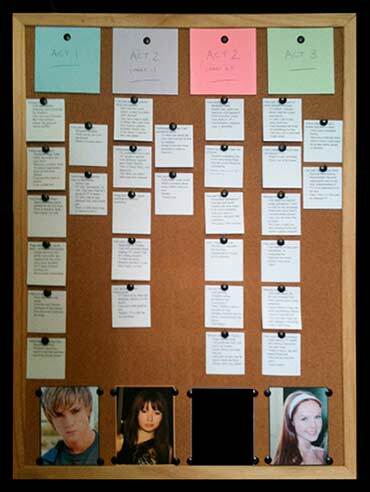 Once I had the timeline complete, I could see whether there were clear sections of it that could split into individual stories. It turns out there were two perfect turning points that could serve as the end of story one and two, while the Final Showdown would be story 3’s climax. Sometimes the world works in strange ways. Wonderful, but strange. You may remember late last year I attended a workshop on applying for grants (and blogged about some of the things I learned), then in October I had a go at applying for a well renowned scholarship. One of the many reasons I was applying was with the far flung hope of being able to travel to New York to meet my publisher. I knew the winners of the scholarships were being announced in March, so as the March days trickled by I accepted that I wasn’t one of them. Still really hoping to be able to meet my publisher, I started investigating other possible grants for writers. I made a shortlist of about three I was eligible for, and on the final day of March I sat down to begin writing my applications. As my fingers hovered over the keyboard, I got a call on my mobile. And nearly dropped it. It was a delightful lady, ringing to tell me that I had been awarded a 2010 Marten Bequest Travelling Scholarship. For a writer, I was embarrassingly lost for words. The … Scholarships provide support for young Australians in a variety of categories to help them further their cultural education and achieve their dreams. They are awarded each year for study, maintenance and travel either in Australia or overseas. The scholarship will span over two years, and true to their word it will allow me to access opportunities that have so far been purely the stuff of dreams. So it turns out I will get to meet my publisher, next year in January while I’m in New York for the annual SCBWI Winter Conference. I’ll also get to attend some other conferences, research a series of middle grade novels set in South America, research a new YA novel I’m currently planning set in the UK, plus have some dedicated writing time away from other commitments. WARNING: For all those who feel secure in their homes, let it be known that in this digital age – no one is safe. Not even bunny loving writers. Did you know you can take screen shots (photos) via skype? Clearly this goose didn’t. I was innocently skyping with a good friend the other day (you know who you are), goofing around as I have been known to do, when she discovered how to take screen shots. Of me. Oh the horror. 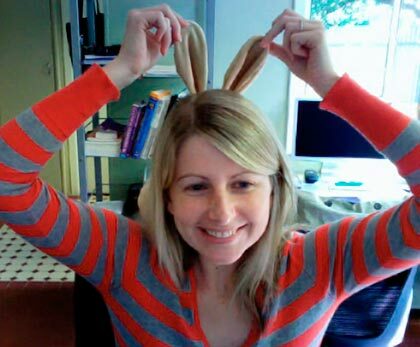 Personally, I feel rabbit ears kinda suit me, but that’s hardly the point.